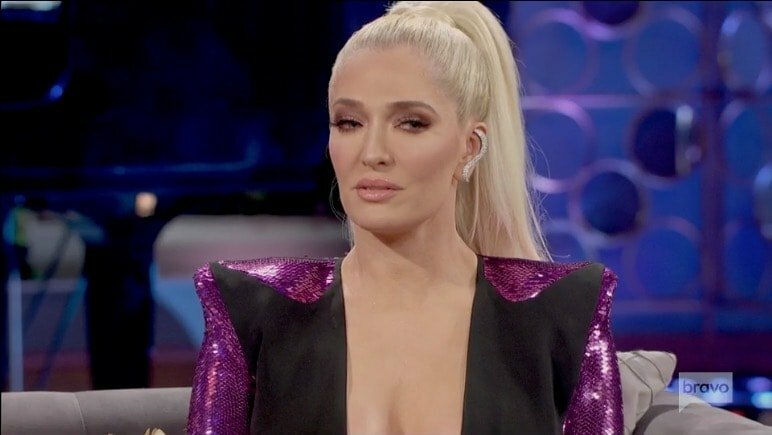 In an interview with PEOPLE Now, Erika was asked if she would want either Kim or Brandi to return to the cast full-time. Crafty Erika answered, “I think that they’re both great showmen. I have no idea. I don’t make the cast…cast the show.” Very Switzerland of you Erika-sometimes neutrality is the best option! And we know that if you cast the show, you would be the only Housewife, with your glam squad-and maybe your hubby Tom Girardi– as occasional guest stars! Erika began as a full-time cast member on Season 6-and Kim and Brandi left as full-time Housewives after Season 5. So, Erika’s exposure to them is pretty limited as far as filming goes. And as Kim’s sister Kyle is a current cast member-and no one-not even fearless Erika-would want to get on Twitter happy Brandi’s bad side. It is understandable that the usually outspoken Erika hedges her bets in talking about the two. Who are these “few people” Erika is talking about? For starters, who would Brandi’s presence make uncomfortable? The obvious answer is the entire cast! Brandi’s loose cannon, take no prisoners attitude has raised the ire of many a Beverly Hills Housewife. At different times, Brandi has had heated arguments-or major feuds with almost everyone she ever filmed with-Yolanda Hadid probably being the only exception. The person who would really have the most difficulty in encountering Brandi, however, would likely be Lisa. Their friendship, long on shaky ground, disintegrated after Brandi slapped her in Amsterdam during Season 5. As Brandi left the show after that season, the two had no opportunity to repair their relationship on camera. And Lisa seemed to have no interest in doing so, anyhow. However, as Lisa is on the outs with almost the entire cast this season. Maybe even Brandi would be a friendly port in a storm! As for Kim, she has also had her share of battles with other Housewives. Most famously, with her sister Kyle, but the two seem to be on good terms currently and her Second Wife To Mauricio Umansky status seems solid. So, who would not want to see Kim return as a Housewife? Again Lisa…but not Vanderpump. Lisa Rinna! Kim and Rinna have a rocky history, largely due to Rinna using Kim’s troubled existence as her own personal storyline. Their ugliest fight was in Amsterdam (what was in the water in Amsterdam?) when a ballistic Rinna smashed a wine glass on a table in anger at Kim after she made a veiled comment about Harry Hamlin. And Kim famously returned a bunny Rinna had gifted for Kim’s grandchild on a reunion show! Oddly enough, from what we saw in the season trailer, Kim appears to get into it with another Richards-but, not Kyle–Denise Richards. As Denise seems to be a laid back, difficult to ruffle, Malibu beach dwelling kind of person, what could the two argue about? We will find out in the coming weeks. My guess would be it has something to do with Rinna and Denise’s friendship. Or maybe Kim is just over dealing with other Richards women! As we are about halfway through a typical season, I am excited to see how everything plays out. A cast trip to France and the saga of LVP vs. Everyone will round out what has been a great season. And here’s hoping we see the completion of LVP’s kitchen remodel-which is turning into a very expensive saging of Kyle’s toxic presence from Villa Rosa! TELL US-WOULD YOU LIKE TO SEE KIM OR BRANDI COME BACK AS FULL-TIME HOUSEWIVES? WHAT FORMER CAST MEMBERS WOULD YOU LIKE TO SEE RETURN TO THE SHOW?